The clues are meaningless except for each of their words' first letters. Each answer is comprised of the initial letters of one word from its own clue, one from the next clue, and so on (wrapping around from the end of the Down clues back to the beginning of the Across clues). The words for each answer are shown in a single color in the clues below. 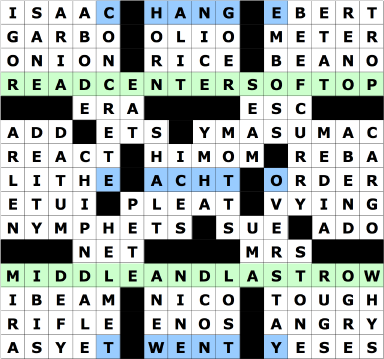 After the grid is filled, the two long entries spell READ CENTERS OF TOP MIDDLE AND LAST ROW. The middle six letters of each spell CHANGE EACH TO TWENTY. 23 e. e. cummings's "one regret"
30 "Don't ___ your temper!" 51 Done playing NFL exhibition games? 7 "Not on a dare!" 10 Eats everything on the counter? 26 Rock and roll "Doctor"
27 "Did you ever ___ love me?" 33 The agony and the ecstasy? 57 Adam and Eve's indecent exposure? 59 "I didn't expect you!"